Continuing my spring 2012 theme of no prints and no brights, I really like the blues the Chanel house used for their collection. The shades ranged from a pale ethereal blue to inky bluish-black. This season’s collection pays homage to Coco Chanel’s signature camellias, bows, and schoolgirl collars. When I worked at the Austin Neiman-Marcus clearance center years ago, they occasionally received Chanel couture suits or gowns that hadn’t sold in the regular store. The workmanship and attention to detail was like nothing I’d ever seen. The linings were as beautiful as the outside of the garments. The jackets had a little chain along the hem to weigh down the fabric so they hung properly. One time I tried on a sequined black evening dress that even at 75% off was beyond my budget but it was stunningly beautiful. I would love to find a vintage Chanel suit at a flea market in Paris but the days of finding that kind of treasure are long gone. I actually like some pastels, just not on me. The flowers on this coat are wonderful. I love the collar on this dresss, and the camellia is a nice touch. Perfectly elegant evening dress with camellia on the shoulders. The first photo is from the Chanel website; the other images are from the French magazine, Au Feminin. My perusal of the spring 2012 fashion rags was not nearly as interesting as my scouring EVERY PAGE from the September issues. Part of the problem is that I prefer autumn’s colors and richly textured fabrics to spring’s pastels (ugh) and lightweight clothes. I live in the Pacific Northwest, so spring means chilly rain, and those lovely lightweight clothes just don’t cut it for 10 months out of the year. I also have issues with pastels and bright colors, thanks to growing up in south Florida, home of orange slacks for men. I was forced coerced into wearing pastel clothes as a girl, and have never really gotten over that. My dress for the National Junior Honor Society induction was a pale mint green scratchy chiffon hand-me-down with ruffles – it was as ugly as it sounds. 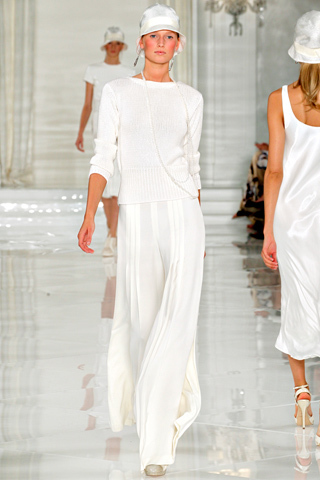 I have learned to like summer whites, which I wrote about recently. For a look at pretty spring trends that include pastels, my friend Catherine just wrote a post about Chanel and Carolina Herrera’s spring lines. I love the Chanel suits she is lusting after but disagree about the Jetson shoes – I think they’re pretty slick. The clothes I liked this season weren’t all from one designer, or all one style or color, so this is a pastiche of what I found interesting and within the realm of wearable, though not necessarily affordable. And “wearable” doesn’t mean a particular outfit wouldn’t benefit from the proper foundation. Simple elegance – Les Copains cream silk skirt and black sweater. This little black dress from Les Copains is wonderful, with great tailoring and interesting but subdued trim on the hem. I like the muted colors and shape of this sophisticated Maxime Simoens dress. This Alberta Ferretti suit struck my fancy! I’d wear it with a longer slip but that’s just me. For summer fun, this nautical outfit by Dundop is great. The suspenders need to go but I really like the shoes. Back to real life now. My spring wants are minimal so far – a purple cardigan, red ballerines, and a striped sailor shirt. Oh, and that Les Copains dress. I like the fresh, summery look of white clothes for spring and summer; it portends warmth and sunshine. 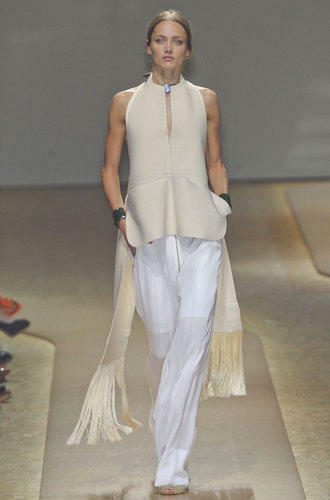 Looking through the Spring and Summer 2012 collections, I found some beautiful white outfits to moon over. In real life, I rarely wear white because I’m a menace with colored pens at work, and it’s muddy and rainy most of our spring anyway, which doesn’t lend itself to a crisp look. And it makes me look paler… in a blueish, sickly way. But I admire people who pull it off, and might try again with a red or black scarf near my face. 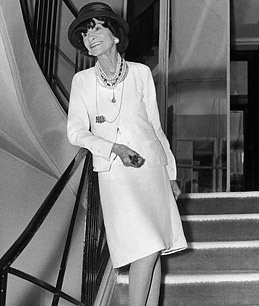 Mademoiselle Chanel pulls it off so well – I love the jaunty hat! This is my favorite outfit – the trousers are very flattering. I can imagine wearing this on a Grand Tour of Europe. But not my real life taking the Metro and sitting on grungy park benches. I think this is an interesting combination of sheer white, cream, and not-so-sheer white. Great tailoring and design; I like the black accent along the front. Interesting, though not my style. Wouldn’t this be great for a cocktail party on my villa in Lake Como? One thing I’ve never understood is the adage not to wear white until Memorial Day or after Labor Day. Really, if it’s warm enough out, why not? For some history, see Laura Fitzpatrick’s article in Time about that (silly) tradition. I’ve decided to completely ignore the concept of wearable shoes for this post, and focus on shoes that I could display as lovely works of art. If I had a large enough wall, I’d have a little shelf made for each pair. For a look at real life shoes from the Spring 2012 collections, see my friend Catherine’s post. I like the shape and heel on these handmade shoes. Riccardo Broglia Rizieri is an Italian designer who makes bespoke shoes from used and other “green” materials. They have fuschia leather soles – who says Mr. Blahnik is the only one with colorful soles? London designer Charlotte Olympia Dellal created this interesting shoe. I really like the gold, airy heel on this. I love the retro look of these Prada heels. The fins and little red light are so charming, and I like the green leather. To me, the elegant curve of the heels on these Roger Vivier shoes feel more like a sculpture than something to walk around on. 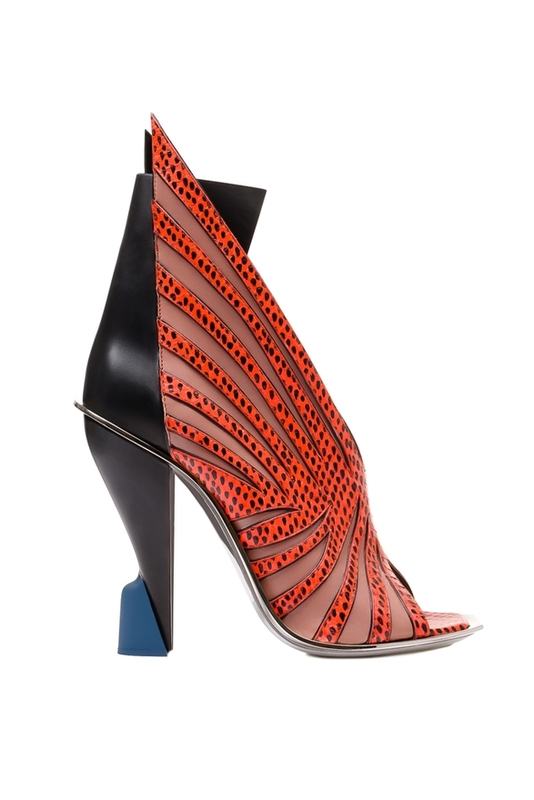 Balenciaga surprised me with these futuristic looking heels. I like the pebbled inserts, and the design in general. Next up, whites! It’s not summer yet but a woman can dream.